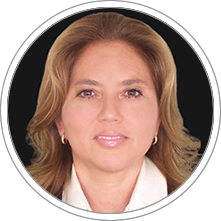 Professor Sandra Ricardo holds a Masters degree in Clinical Neuropsychology, Universidad Europea Miguel de Cervantes, Spain, a Masters degree in Clinical Educational Psychology, Universidad de León, Spain, and an undergraduate degree in Business Administration from Universidad Santiago de Cali, Colombia. She pursued a specialization course in Intellectual Development and Education at Universidad Santiago de Cali, Colombia. She has a certificate in Parent Education and Training from UCLA, USA, and she is an ontological coach certified by the International Coach Federation (ICF). In addition, Professor Ricardo is a neuro-linguistic programming professional certified by the Southern Institute of NLP; she is a specialist in neuromanagement certified by the Institute Braidot Business & Neuroscience; and she is a Benziger Thinking Styles Assessment licensed professional. She has more than 23 years of experience in Emotional Intelligence, as well as in administration, pedagogy, psychology, and coaching. She has a vast experience in the design, development, implementation and evaluation of educational psychology projects for education institutions, in the area of intellectual operations and the development of work skills. Professor Ricardo has managed high-performance teams; she has been a coach of emotional competencies applied to people management and retention within organizations; and she has been an independent consultant in educational neuropsychology projects for the development of managerial skills. She currently is a Consultant and a Professor at the Strategy and Leadership department at CENTRUM Católica Graduate Business School.